There is no doubt about it that the prairies have some of the harshest winters out there. But there is a silver lining, and that is keeping cozy by the fire in the bitter cold months in the comfort of your own home. There is no shortage of different options to customize a fireplace with lots of options available for aesthetic and function. 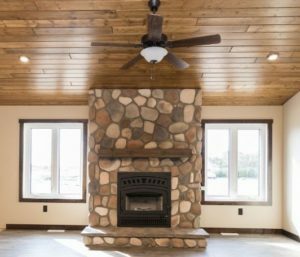 Three popular options for B&B Homes clients are traditional wood burning, gas and electric fireplaces. Wood burning fireplaces are a traditional option that have been heating homes naturally for decades. 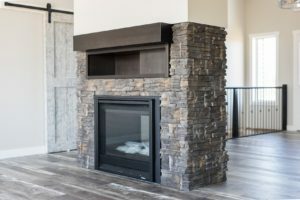 This tried and true style of fireplace requires a little more upkeep than more modern gas and electric options and is not as efficient at producing heat. But if the scent and ambiance of the burning logs is what you are after, the additional maintenance can be considered a labour of love when maintaining your wood supply and cleaning your chimney seasonally. 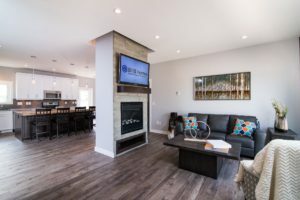 Gas fireplaces are a stylish, modern option that provide flexible heat and aesthetic options by efficiently burning natural gas or propane instead of wood. There are a number of options for gas logs that create the ambiance of your flame. Gas fireplaces are also enclosed, providing safety from embers without requiring any chimney maintenance. Gas fireplaces also provide an alternate heat source for the home. Electric fireplaces allow you to have the visual of a fire without having to produce any actual heat allowing for use all year round to create a relaxing ambiance at your leisure. You could even get a tv stand with electric fire place built into it. This gives an extra level of aesthetic appeal. Most electric models B&B sources do give you the option for both flame and heat or just the flame. An environmentally conscious option, electric fireplaces do not use any gas or produce any emissions. Do you want to warm up by your own brand new fireplace next winter? Are you ready to start planning your own custom RTM dream home with B&B’s Dream It, Build It, Move It process? Contact Suzanne directly at suzanne@bbhomes.ca to get started.